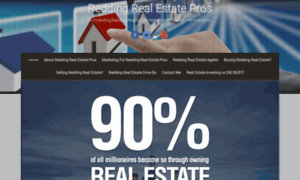 We prepared the full report and history for Reddingrealestatepros.com across the most popular social networks. Reddingrealestatepros has a poor activity level in Google+ with only 3 pluses. Such a result may indicate a lack of SMM tactics, so the domain might be missing some of its potential visitors from social networks. As for Twitter and Facebook activity - Reddingrealestatepros.com has - mentions and 0 likes.